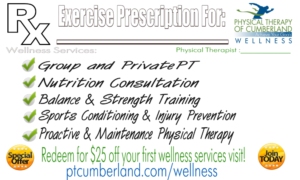 Thank you for your interest in Physical Therapy of Cumberland Wellness Services. Upon completion of this form, one of our team members will get back to you within one business day to complete your request. You can also call or text our dedicated wellness line 401-646-9787 during regular business hours if you need immediate assistance. Please note: If you’d like to request a copy of our current program service fees, learn more about our upcoming Oppen-Trainer Stroke Study, schedule a PrivatePT or Otago Assessment be sure to leave those details in your message. Please indicate in the message box below which day you’d like to join us for a class, schedule your appointment or receive a call back so that we can most efficiently respond to your request. ps— If you have written a review of my book Body in Balance on Amazon and are contacting me to receive your bonus digital downloads, please leave the link to your review below when you send me your message along with your contact details. Once your purchase and review are verified I’ll email you your bonus book materials. Thank you! Learn more about my book and this offer here.